I WAS READING an article by Barry Rubin called A Middle East Strategy for the West, when I read this sentence: "The problem is not just that cynical rulers (in the Middle East) mislead the masses through demagoguery — though that's true; it's that the masses embrace extremist world views." I had to do a doubletake. If the masses are embracing it, then it's not extremist, right? It's mainstream. By the term, "extremist world views" he is really saying "following classic, mainstream Islamic teachings." But what a politically-correct, double-talk way of saying it! Obtaining Israel-Palestinian or Arab-Israeli peace is a useless strategy, distracting from real issues. It isn't going to happen; Islamists would use any such peace to portray those signing it as traitors; and even many Arab nationalists would denounce it to raise their credibility as tough, unyielding fighters. Violence and unrest would increase, not lessen, as a result. Absolutely. All this talk of "peace in the Middle East" is ridiculous. It's not going to happen. EVER! Get over it. Orthodox Muslims will not ever give up trying to "drive the Jews into the sea," and the Israelis will not ever give up trying to survive. The world needs to embrace this reality and aim for something actually attainable: An Israeli population that is relatively safe from Jihadis. I'm not a Jew, by the way. I don't have any special attachment to the Jewish religion or Israel, except that it's a democracy, and by far the best democracy in the Middle East. As Glen Reinsford wrote in his article Understanding the Arab-Israeli Conflict, "Perhaps the greatest of all ironies in the present-day Middle East, as David Horowitz has pointed out, is that Arab Israelis enjoy more social, legal and political freedom than do Arabs in any one of the fifty-three Muslim countries." Ironic because so many Arabs are hell-bent on destroying Israel. But Israel needs to embrace this reality too and quit bending over backwards to "make peace." They keep being lured into making deals with the ruling Jihadis of the day in order to finally have "peace." They should be able to look at their own history in the Middle East, or look at easily-obtained Islamic teachings and see that "peace agreements" with Jihadis are worse than a waste of time (for example, Qur'an 9:1-17). Another very basic Islamic principle nobody in Israel or the U.N. seems to be aware of is the principle of taqiyya. That is, the allowance and even encouragement by Islamic teachings for Muslims to deceive non-Muslims in order to further the political goal of Islam, which is dominance over all other governments and religions. These are very basic Islamic teachings anyone can discover with very little effort. They are not obscure, hard-to-decipher teachings. But here is Israel, having been duped and tricked and lied to again and again by people who are quite open about their dedication to fundamental Islamic teachings, making more "peace agreements" with Jihadis! It's absolutely crazy. They should give "giving up on peace" a chance. It's not that peace isn't a worthy goal, of course. But the idea of peace as in "living together in harmony" is something to throw out the window when it comes to Israel and the Muslim world. It's kind of like having breast cancer and saying, "Okay, cancer, I'll give you one breast, and then we can live in peace together." No, you can't. If you don't stop it, the cancer will metastasize. That's its nature. That's what it does. And the orthodox Muslim world will continue to undermine, fight, and try to destroy Israel. That's its nature. That's what it does. Which means if Israel wants to survive, it had better quit trying to appease Muslims and accommodate Islam's demands and concede to the Muslims' wishes and start drawing the line, and saying "no further." And not just Israel. The U.N. has pressured Israel to appease and accommodate and concede. Why? Because there are lots of Muslim countries in the U.N. who have used taqiyya successfully. What the world has been doing about the Israeli-Palistian conflict has not worked. Let's try something different. We could change what we mean by "peace." Peace might mean "the good guys have the upper hand." It might mean the good guys have enough power to hold Islam's relentless encroachment at bay so the rest of us can live in harmony with each other. How do we decide who is the "good guy?" Whoever is promoting liberty and equality, not just in words but in fact. And anyone promoting Shari'a or jihad does not promote liberty and equality. "Kafir911," an occasional commenter on Citizen Warrior said: "I think it's sad but telling that the man who started that whole movement (the 'let's give peace a chance' movement), John Lennon, with his Make Love not War and his love-ins with Yoko Ono, got shot by an idiot with a gun. So apparently its not true that 'all you need is love.' You need protection as well." Let's just give up on the idea of peace. Let's give up on the idea that somehow everyone can just get along. And let's aim at international security. There is no "getting along" with an organized, relentless group of people who spend their every waking moment seeking your destruction. But it is possible to contain them and limit them and weaken them. Let's be realistic and aim for those. Let's aim for the protection of liberty and equality. It is the nature of Islam to dominate, not to be dominated, to impose its law on all nations and to extend its power to the entire planet. If those championing Islamism were only stateless terrorist groups and tin-pot dictators, their geostrategic significance would be minimal. But the regime that rules Iran is dedicated to waging what it calls a global Islamic revolution. And in Saudi Arabia, the state religion is Wahhabism, a strain of Islam that preaches the inferiority of infidels and the rejection of Muslims who do not share Wahhabi ideals. 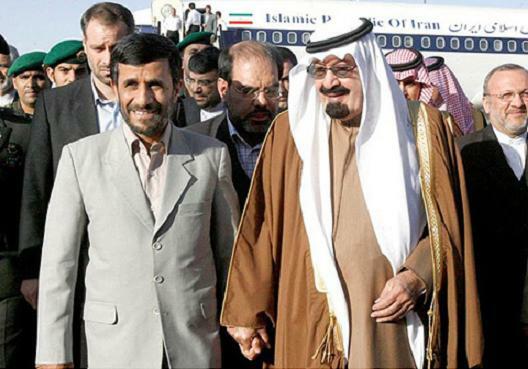 These regimes float atop an ocean of oil, a commodity that is valuable thanks to those the Islamists despise. It was the Western mind that figured out how to pump oil out of the ground and refine it into a variety of fuels, including those used in internal-combustion engines, another history-bending Western invention. Imagine you are one of the rulers of Iran or Saudi Arabia: Fabulous wealth is yours due to no intellectual or physical labors on your part. If you invest that wealth wisely, you’ll make even more, but if not, so what? Wealth will flow to you every single day as surely as rivers run to the sea. To sell rugs, olives, or computers requires salesmanship. But oil sells itself: Those who depend on it for their cars, ships, and planes have no other options. Well, theoretically, they do: They could take it by force. But you need not worry about that because, as you are well aware, modern Western ethics prohibit such behavior. If there were even one oil-rich, Muslim-majority nation solidly committed to liberal democratic values, to freedom of religion and speech, to tolerance and minority rights, the challenges of the 21st century would not be so formidable. But there is no such nation. Almost 80 percent of global oil reserves are controlled by the Organization of Petroleum Exporting Countries (OPEC), a cartel, a conspiracy in restraint of trade. Most OPEC countries are autocracies. Many are hostile toward America and other free nations. From the income produced by OPEC oil comes most of the money used to train and arm terrorists around the world, and to build nuclear-weapons facilities in Iran. He notes that the Methanol Institute, a private industry group, estimates that producers can, right now, deliver an amount of fuel equivalent to the energy in a gallon of gasoline for approximately $3. The cars we drive would require only minimal and inexpensive modifications in order to run on methanol — as race cars already do. Let me emphasize: McFarlane is not proposing that we stop using gasoline and other petroleum products. He is not proposing government subsidies for natural gas, methanol, or other fuels. On the contrary, he is making the case for eliminating subsidies and government favoritism of one fuel over another. He and others are arguing for breaking the monopoly that oil currently enjoys and encouraging the creation of a competitive fuel market. If, for any reason, that does not happen, only those who invested their own money would suffer. If it does happen, however, having a larger fuel supply from more than one source would provide multiple benefits: It would reduce the funds available to Islamists (strengthening national security), bring down the cost at the pump and reduce price volatility (easing the burden on families, commuters, truckers, etc. ), and keep more money and jobs in the United States, thereby reinvigorating the domestic economy (good for those who live, work, and invest in America). The downside? There is no downside. “Friedrich Hayek and Milton Friedman stressed that the foremost economic duty of government is to eliminate cartel pricing,” McFarlane notes. At the moment, however, government is not doing its economic duty. Nor is it doing its national-security duty: It should not require a Clausewitz to grasp that transferring unprecedented amounts of wealth to your enemy in a time of war is counterproductive. Yet, at the moment we are knowingly funding the “violent extremists” who want to kill us, as well as the more moderate Islamists who merely want to dominate us. — Clifford D. May is president of the Foundation for Defense of Democracies, a policy institute focusing on national security and foreign policy. Mark Thompson, the head of the BBC, admitted in a public interview that his fear of Muslim retaliation causes him to treat Muslim stories with far more sensitivity than Christian stories. In his most telling comment, Thompson said: "Without question, 'I complain in the strongest possible terms,' is different from, 'I complain in the strongest possible terms and I am loading my AK47 as I write.' This definitely raises the stakes." He says he knows his fear creates censorship. We applaud Thompson for his honesty. But his censorship creates more problems than it solves. A recent Spectator article goes into detail about some of the problems this kind of censorship can cause. Read the article here (and then share it with your friends, especially those friends who are fans of the BBC). Watch Thompson's half-hour interview here. Islam is different from other religions in at least one important way: It began at a time and in a place where no empire constrained its spread. In other words, if you start a religion within the Roman Empire, you're going to have certain limitations. The Romans would see any new religion — especially a militant or political religion — as a threat to its power and would make sure you stayed peaceful. A religion that preached tolerance and goodwill toward others might survive, but a violent or militant or political new religion would be quashed immediately. But Islam had no such restriction when it began, so it could incorporate "conversion by warfare" into its memeplex, and it did. As Aaron Lynch wrote, "The faith provides for a jihad or holy war, which historically led to Islamic rule over whole societies." Once a country has been attained by war, pagans were often given the choice: convert to Islam or die. That is written into Islamic law. If any members of the newly acquired country are Christian or Jewish, they are required to pay special taxes and become a second-class citizen, unless they want to convert. HOW CAN you reach someone? That's the basic question, isn't it? You want to share what you know about Islam with people you love, and you want them to listen to you. What can you do to make them more likely to listen to you? Take Henry G. Duvernoy of Duvemoy and Sons, a wholesale baking firm in New York. Mr. Duvernoy had been trying to sell bread to a certain New York hotel. He had called on the manager every week for four years. He went to the same social affairs the manager attended. He even took rooms in the hotel and lived there in order to get the business. But he failed. "Then," said Mr. Duvernoy, "after studying human relations, I resolved to change my tactics. I decided to find out what interested this man — what caught his enthusiasm. "I discovered he belonged to a society of hotel executives called the Hotel Greeters of America. He not only belonged, but his bubbling enthusiasm had made him president of the organization, and president of the International Greeters. No matter where its conventions were held, he would be there. "So when I saw him the next day, I began talking about the Greeters. What a response I got. What a response! He talked to me for half an hour about the Greeters, his tones vibrant with enthusiasm. I could plainly see that this society was not only his hobby, it was the passion of his life. Before I left his office, he had 'sold' me a membership in his organization. "In the meantime, I had said nothing about bread. But a few days later, the steward of his hotel phoned me to come over with samples and prices. "'I don't know what you did to the old boy,' the steward greeted me, 'but he sure is sold on you!' "Think of it! I had been drumming at that man for four years — trying to get his business — and I'd still be drumming at him if I hadn't finally taken the trouble to find out what he was interested in, and what he enjoyed talking about." If you want people to listen to you, if you want to reach people, if you want to influence people, start by talking to people about what they really care about. It will not only transform your ability to persuade, it will vastly improve the feelings of connection you have with each other. A growing threat to our freedom of speech is the attempt to stifle religious discussion in the name of preventing “defamation of” or “insults to” religion, especially Islam. Resulting restrictions represent, in effect, a revival of blasphemy laws. Few in the West were concerned with such laws 20 years ago. Even if still on some statute books, they were only of historical interest. That began to change in 1989, when the late Ayatollah Khomeini, then Iran’s Supreme Leader, declared it the duty of every Muslim to kill British-based writer Salman Rushdie on the grounds that his novel, The Satanic Verses, was blasphemous. Rushdie has survived by living his life in hiding. Others connected with the book were not so fortunate: its Japanese translator was assassinated, its Italian translator was stabbed, its Norwegian publisher was shot, and 35 guests at a hotel hosting its Turkish publisher were burned to death in an arson attack. Click here to read the whole article (and share it with your friends). I DON'T KNOW HOW she did it, but Ali has an article in the February 13 issue of Newsweek. Not only that, but it's the cover story! The cover says simply, "The War on Christians." The name of the article is this gem: "The Rise of Christophobia." She makes some great points in the article, including an admonition to pay attention to the differences in "intolerance." The "intolerance" in the West comes in the form of cartoons, films, and writings. The intolerance against Christians in the Muslim world is expressed with knives, guns, and grenades. In the article, she takes the Western media to task for not covering the war on Christians better. This is excellent. Count one point for our side and celebrate the victory.